The hold is a 2" x 2 3/4" gap in the main deck located about 2" in front of the rear mast. I cut 1" into each deck half with a table saw by clamping the two deck halves together and feeding them vertically into the blade. After making multiple cuts I cleaned out the rest of the scrap with a chisel. 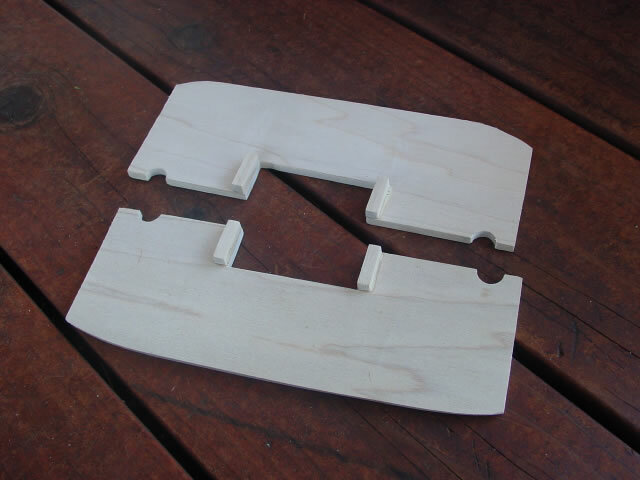 The supports for the hatch are small 1" pieces of 1/4" square wood glued flush with the front and back of the hole. Don't glue any supports on the sides of the hold. The hatch cover is a 4 1/4" x 2 1/2" piece of 1/4" poplar board, the same as the deck material. On the underside is a set of four 1/4" x 1/4" strips, forming a box that goes around the supports glued to the main deck.